Understanding how fire and other disturbances affect ecosystem health and resiliency is critically important for land managers and for society as a whole. Anderson, Kyle E.; Glenn, Nancy F.; Spaete, Lucas P.; Shinneman, Douglas; Pilliod, David S.; Arkle, Robert; McIlroy, Susan; Derryberry, DeWayne R.
Campbell, J.L., Shinneman, D.J., 2017, Potential influence of wildfire in modulating climate-induced forest redistribution in a central Rocky Mountain landscape: Ecological Processes, v. 6, no. 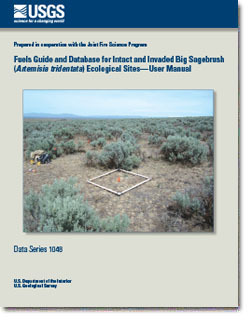 1, p. 1-17, http://dx.doi.org/10.1186/s13717-017-0073-9. 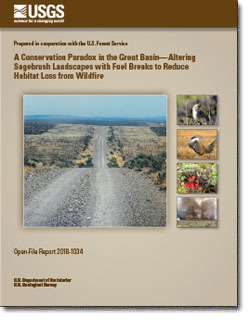 Shinneman, D.J., McIlroy, S.K., 2016, Identifying key climate and environmental factors affecting rates of post-fire big sagebrush (Artemisia tridentata) recovery in the northern Columbia Basin, USA: International Journal of Wildland Fire, p. online. Shinneman, Douglas; Means, Robert E.; Potter, Kevin M.; Hipkins, Valerie D.
Chambers, Jeanne; Shinneman, Douglas; Halford, Anne S.; Howell, Cheri; Krasnow, Kevin D.; Strand, Eva K.
Brabec, Martha M.; Germino, Matthew J.; Shinneman, Douglas J.; Pilliod, David S.; McIlroy, Susan K.; Arkle, Robert S.
Brabec, M.M., M.J. Germino, D.J. Shinneman, D.S. Pilliod, S.K. McIlroy, and R.S. Arkle. 2015. Challenges of Establishing Big Sagebrush (Artemisia tridentata) in 3 Rangeland Restoration: Effects of Herbicide, Mowing, 4 Whole-Community Seeding, and Sagebrush Seed Sources. Rangeland Ecology and Management: 68(5):432-435. Shinneman, D.J., Palik, B.J., Cornett, M.W., 2012, Can landscape-level ecological restoration influence fire risk? A spatially-explicit assessment of a northern temperate-southern boreal forest landscape: Forest Ecology and Management, v. 274, p. 126-135. Rickenbach, M., Schulte, L.A., Kittredge, D.B., Labich, W.G., Shinneman, D.J., 2011, Cross-boundary cooperation- A mechanism for sustaining ecosystem services from private lands: Journal of Soil and Water Conservation, v. 66, no. 4, p. 91A-96A. Fraver, S., Jain, T.B., Bradford, J.B., D'Amato, A.W., Kastendick, D., Palik, B.J., Shinneman, D.J., Stanovick, J., 2011, The efficacy of salvage logging in reducing subsequent fire severity in conifer-dominated forests of Minnesota, USA: Ecological Applications, v. 21, no. 6, p. 1895-1901. Shinneman, D.J., Cornett, M.W., Palik, B.J., 2010, Simulating restoration strategies for a southern boreal forest landscape with complex land ownership patterns: Forest Ecology and Management, v. 259, p. 446-458. Bauer, M., Loeffelholz, B., Shinneman, D.J., 2009, Border Lakes Land-Cover Classification: U.S. Department of Agriculture, Forest Service, Northern Research Station Research Map NRS-1, p. 14. Shinneman, D.J., Baker, W.L., 2009, Environmental and climatic variables as potential drivers of post-fire cover of cheatgrass (Bromus tectorum) in seeded and unseeded semiarid ecosystems: International Journal of Wildland Fire, v. 18, p. 191-202. Shinneman, D.J., Baker, W.L., 2009, Historical fire and multidecadal drought as context for piñon–juniper woodland restoration in western Colorado: Ecological Applications, v. 19, no. 5, p. 1231-1245. Sturtevant, B.R., Scheller, R.M., Miranda, B.R., Shinneman, D.J., Syphard, A., 2009, Simulating dynamic and mixed-severity fire regimes- A process-based fire extension for LANDIS-II: Ecological Modelling, v. 220, p. 3380-3393. Shinneman, D.J., Baker, W.L., 2008, Ecological restoration needs derived from reference conditions for a semi-arid landscape in western Colorado, USA: Journal of Arid Environments, v. 72, p. 207-227. Baker, W.L., Shinneman, D.J., 2004, Fire and restoration of piñon–juniper woodlands in the western United States- A review: Forest Ecology and Management, v. 189, p. 1-21. Shinneman, D.J., Baker, W.L., 2000, Impact of logging and roads on a Black Hills ponderosa pine forest landscape In: Knight, R.L., Smith, F.W., Buskirk, S.W., Romme, W.H., Baker, W.L., eds., Forest Fragmentation in the Southern Rocky Mountains: Boulder, CO, University Press of Colorado, p. 311-335. Shinneman, D.J., Baker, W.L., 1997, Nonequilibrium dynamics between catastrophic disturbances and old-growth forests in ponderosa pine landscapes of the Black Hills: Conservation Biology, v. 11, no. 6, p. 1276-1288.